This page is only for comments and suggestions that you’d like to share. If you have a question or problem installing, please drop me a line. Thanks. Thank you so much for the great work in GeodesiX. I am just starting out on an effort to use Excel VBA to control the overlay of a track obtained from a GPS device (KMZ format, but could be any other in current use) onto a Google Earth map, and then insert the result into the Excel file. It seems that much of what you have done with GeodesiX may be directly applicable to my effort. If you created your add-in in VBA or Excel, and if you are willing to share the source code, I would greatly appreciate it. Our application will be distributed by an NGO free of charge, and will not be proprietary. If you do not want to share the source code, or it is not VBA/Excel based, I certainly understand. If you have any tips or suggestions for a newbie, please send them along. ich nutze VBA und möchte mit der Google Maps API v3 die Geodaten für mehrere Anschriften ermitteln. Diese möchte ich dann per Marker (kleiner roter Punkt) in einem Formular meiner Access-Datanbank (WEBBROWSER-Steuerelement) darstellen. Kannst Du mir vielleicht einen einfachen Code-Ansatz für VBA liefern oder eine Beispieldatei mailen. Thank you. This is just amazing – I’ve adapted it to use for keeping a visual catalogue of my contractors and employees all over Sydney, Australia. This allows me to quickly see which staff I have to respond to client enquiries in any given location. This is exactly what I needed, and I sincerely thank you for such wonderful work. 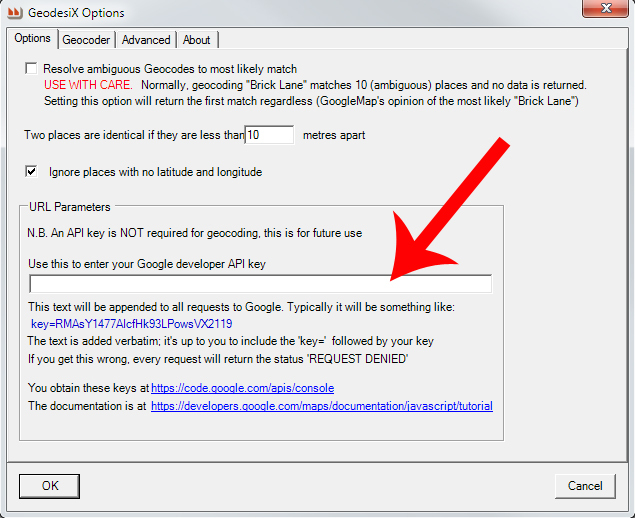 No, as there is no API key for geocoding requests. In Google Maps API for Business, quotas are tied to client IDs, which provide much higher quotas. 100,000 geocode requests per day. I’d love to be able to use my client ID with Geodesix to up my quota. As I don’t have such a key, I can’t test it. Let me know if it works? Thank you for developing and sharing this. You Rock! Really impressed by the work. You went throught an amazing amount of traps and kept safe … congratulation for the result. It isn’t in the FAQ, it’s in the demonstration spreadsheet that starts automatically when you install GraphVizio. Reverse geocoding is identical to forward geocoding, just enter the latitude,longitude as the search term. I noticed that the online demo had a street view by placeing the little yellow man on a location, does the Excel version have this integrated at all? No, sorry, the embedded Excel version doesn’t have street view. I was playing around with the html file and switched line 388 from “streetViewControl: false,” to “streetViewControl: true,” and it seemed to do the trick. I do get a error message in the pop up message bar, probably something to do with ActiveX Control, but the streetview does work despite the error message. The download and contact links are broken.